An Aquarius and Pisces pair is very common: they are very different, so you can not say that their relationship is ideal. The first belongs to the air element, which gives him lightness, optimism and developed intelligence. 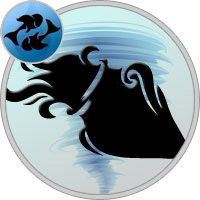 In addition, Aquarius has creative thinking and strives for novelty. In the creativity, the sign of Pisces represents for him a strong competition and at times more successfully find themselves in this sphere. They belong to water and are as deep, soft and sensual as their element-protector. The creation of a union consisting of these signs entirely depends on the desire of the Pisces. If they do not want to have anything in common with Aquarius, then it will be, despite the feasible efforts of the air element. Both representatives of the horoscope are interesting and profound personalities: they like to dream and commit adventurous acts. But Aquarius needs such shakes constantly, and Pisces only occasionally. This fact can cause their mutual misunderstanding. The latter are more slopes to stability, and Aquarius does not understand his life without vivid impressions and excitement. Their perception of the world is also excellent: the air sign is egotistical, it is friendly, but at the same time zealously protects its personal space, remaining closed to others. His interest in people is superficial, so he quickly switches from one to another, without being attached to a person morally. Pisces is different: it is their spiritual affection that is most valued by them, and they are striving to achieve it in a relationship. For this purpose, the stars were awarded their empathy — the ability to genuinely empathize, to stand in the place of a partner. According to the horoscope these signs are idealists, but this is manifested in different ways. Aquarius expects from himself perfect ideas that will help him change this world for the better. His main need is to accomplish something that will be known and remembered by a few more generations of people. Pisces idealize in dreams their reality and surrounding people, coming up with something that is not, and after suffering because of disappointment. Compatibility Aquarius and Pisces is at an average level due to their different visions of the world. The first does not want to belong to anyone, family values ​​are alien to him. The second feels better and safer, being in a complete emotional merger with someone, therefore strives to create a strong marriage and wants to be only a company of close people. Each of them has two planets-steward. Aquarius is Uranus and Saturn. The first endowed him with an endless imagination and an innovative character, the second helps to translate his reckless desires into reality through discipline and confidence. The fish are led by Jupiter, responsible for philosophical thinking and craving for knowledge, as well as Neptune, whose influence often entrains them into a world of dreams and fantasies, followed by disappointment and despondency. The horoscope of compatibility of Aquarius with Pisces can be successful, because the latter, thanks to their intuition and empathy, are able to understand the first, which many consider strange - "not of this world". Compatibility of Aquarius and Pisces in work will be high if their goals coincide. The rationality and creativity of Aquarius, together with the flexibility and intuition of Pisces, creates a powerful energy that can break through any obstacles and achieve meaningful results in business. An air sign is often stubborn, but a changeable partner can easily adapt to his requirements, because the cost is at stake. But the compatibility of Aquarius with Pisces in friendship is contradictory. The representative of Saturn values in such relations the commonality of views, interests, the opportunity to achieve something important by joint efforts. For his partner, human intimacy with a friend is important: help at the right time, mutual understanding and moral support. Aquarius seldom sacrifices his own interests for the sake of another, and Pisces is ready to go to much for the sake of a loved one. Not having received the same support in return, they will prefer to leave the tandem. Aquarius and Pisces compatibility in love is quite high: they have every chance to build a prosperous relationship that brings comfort to both. At the very beginning of their romance, everything is just fine: two romance genuinely enjoy each other, alternately arranging beautiful dates. Aquarius is pleased that the chosen one listens attentively, delves into his speech and admires the grandiose plans. He also likes the kindness, responsiveness and simplicity of Pisces. The latter, in turn, seeing themselves "not like everyone else", seek to know his rich inner world. The dreamy representative of Neptune often thinks out in their joint picture the non-existent details, appropriating to the beloved even those traits of character that he does not have. And Pisces does not really care that everything about what the partner says, often borders on science fiction: he believes his beloved on the floor. The compatibility of Aquarius with Pisces in relationships will gradually begin to decline: they will sober out of amorous charms and begin to notice each other not only virtues, but also drawbacks. At this point, lovers need to be wiser and start looking for compromises, otherwise the pair will have a painful break. The main reason for their friction is the superficial attitude of Aquarius towards the chosen one, as well as his frivolous communication with many friends. Pisces want to be the most important person for the other, to feel their need, only then they feel safe. But freedom-loving Aquarius will not be able to break himself enough to give up independence, which he so much cherishes. Therefore, the second sign in the pair will have to be more flexible and adjusted. The compatibility of Aquarius and Pisces in the bed is complicated: despite the fact that both love experiments and variety under the blanket, their approach to this varies. The sign of the air element remains emotionally closed to the partner even in very intimate moments. Pisces want the notorious proximity of souls, simple physical pleasure does not suit them. In this situation, the Pisces will press on the lover, which will further alienate the latter. It can end with the fact that Aquarius simply escapes from uncomfortable relationships. But not everything is so deplorable: signs of air and water are able to get closer, only this will take some time. To fully reveal to Saturn’s ward, you need to make sure that before them a reliable lover, companion and like-minded person, only then will he believe in their relationship. The compatibility of Aquarius with Pisces in marriage is also difficult. The thing is that the former does not see any special value in the family alliance and therefore does not put it in priority. The legalization of relations for Aquarius is a mere formality, to which he does not particularly strive, because this is a kind of restriction of his freedom. Pisces, in turn, only want to: they will idealize the beloved to the last and insist on official registration in the registry office. The further joint life of the partners is full of disappointments and resentments. Aquarius, acquiring the status of a spouse, does not change in any way and continues to dream, to create and develop, that is, to invest oneself and one’s time in dreams and creativity, and not in the family. His partner will repeatedly experience feelings of resentment, because he never gets a warm, cozy home and caring loved one. Disappointment of Pisces will become the moment X, after which there are two possible scenarios: the sign of water will leave this union or choose to adapt to the oddities of the other and follow it right. Thus, the compatibility of Aquarius and Pisces in family life is ambiguous and highly dependent on their personal horoscopes and natal charts of spouses.